Printing on different types of substrate materials and thicknesses. Like glass, ceramic, polyimide, etc. Dispensing with different materials like Epoxies and other types of pastes. Important - Topics discussed here are considered experimental and are not officially supported by Voltera. Please experiment at your own risk! Speaking of flexible circuits. How flexible is cured ink? @a2retro We've tested flex circuits in the past, and have had decent results! To test the ink performance, we first prepared a number of samples consisting of a conductive ink traces on Kapton substrates of different thicknesses (see below). Despite the fact that the ink is not optimized for flexibility, we found that it performed quite well as a flex conductor. The resistance of the trace will steadily increase with repeated flexing, though wider traces are not affected as much. The resistance of the traces will also increase while they are flexed, with larger changes at more aggressive bend radii. 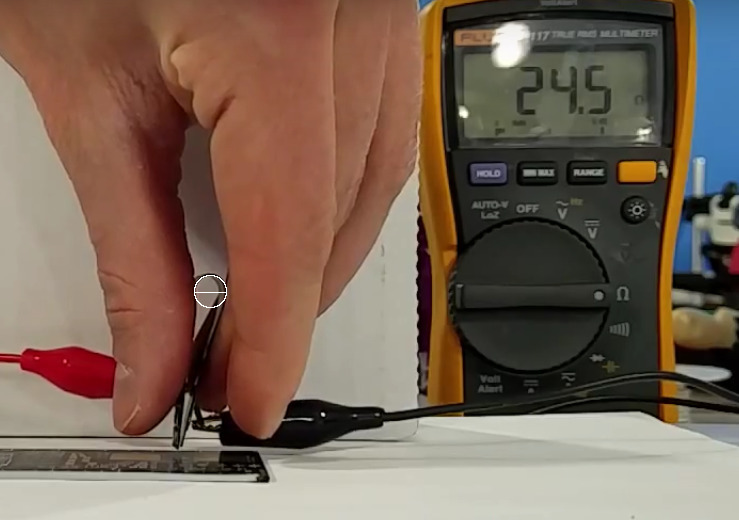 Based on our results, the conductive ink is more suitable for static flex applications (where the conductor is flexed at a fixed bend radius for extended periods) rather than dynamic flex (where the ink is repeatedly flexing). For more aggressive flexing, I would recommend using wider traces to minimize the chance of fracture and to maintain a more consistent trace resistance. This post must have appeared before the flexible ink was available in the store? Regardless of this, I’m interested in testing the concept. What should I best start with, in order to print a Bluetooth (2.4GHz) antenna? The reason I want film substrate is not so much for flexibility, rather I want to plug this antenna into a ZIF connector or similar. You’re correct, this post was before the flex ink was available - the testing was done with our plain conductor. I’d suggest 0.005" polyimide with an adhesive backing. Why do you recommend an adhesive backing for an antenna that stands up (like all antennas)? Is there some extra robustness added that way? Just makes printing / thermal curing easier. If you adhere the kapton to an FR4 substrate, you can make sure it’s completely flat - otherwise, some flex substrates will have air pockets underneath even if you try to keep them flat with clamps. During thermal curing, you can then just flip everything like a normal cure, instead of trying to clamp down Kapton - some substrates will start to deflect upwards and expand when heated leading to incomplete curing, but the adhesive will keep things flat for the whole cure step. After thermal curing, as the temperature is coming down, you can then peel the finished kapton circuit right off the FR4. I’d recommend doing this when the heater is around 60C or so, to make peel-off easier.